Do Sprouting, Culturing, Or Sourdough Reduce Carbs? …and did you know that grains, beans, and dairy contain “sugar” as well? Yes — they are called “carbs”. The starches in grains, beans, and dairy behave much like sugar in our bodies. Yet for others — those with gut issues, excess weight, diabetes, or hormone imbalances — it really helps to pay attention to how many of these carbs we're consuming. For some, this means eating none of them. For others, it means scaling back or only eating them at certain times (ala Trim Healthy Mama). If we use traditional food preparation methods like soaking, sprouting, or sourdough (fermenting) with grains, beans, or dairy, do these processes reduce the carbs in these foods? Check out the particulars in today's #AskWardee in print, podcast, or video below! The Question: Do Sprouting, Culturing, Or Sourdough Reduce Carbs? I have been a member for close to a year. I have a couple of questions. I am trying to bring down my weight and at the same time improve my health and immunity (actually for all my family). One way I am trying to do it is to reduce my carb intake. When sourdough is made from spelt/einkorn or sprouted wheat, are the anti-nutrients, gluten, carbs and sugar reduced, too? Does kefir made from grass fed raw A2 milk contain carbs or sugar? Does sprouting eliminate carbs and anti-nutrients from legumes/lentils or beans? Well, it's true in this case because we're talking about different methods (soaking, sprouting, or souring) and different foods (grains, beans, dairy). All of these foods have carbs. Grains and beans have starches, and dairy has lactose (milk sugar). Soaking doesn't really reduce carbs so I'll leave it out of the rest of the discussion. Yet, sprouting and souring (fermenting) can reduce carbs if done long enough — because consumption of the “sugar” in these foods is part of these two processes and how it works. When you sprout grains, you're taking them from their storage state (a seed) to a young plant (a seedling). During this conversion, involving warmth and water (just as if they were planted in the ground! ), the stored starches turn into food for the young plant. Voila, the carbs are reduced. When souring grains, the fermenting organisms use the starches in the grain as their food source. The longer the souring, the more the carbs are reduced. How much are they reduced, though? As I told you in #AskWardee 035: Is Sourdough Bread Low Glycemic?, souring bread changes the glycemic index from high to low. However, bread is still bread. There are still carbs in it. And sprouted bread uses pretty young sprouts, so while I don't know the exact degree to which the carbs are reduced, I don't think it's as significant as to make it carb-free. Certainly the carbs are lower, though! You can also make bread with sprouted grains and get a further reduction in carbs by combining the two methods! My best and easiest sourdough bread recipe is here: FREE No-Knead Einkorn Sourdough Bread Recipe. Sprouting/souring beans is similar so I won't discuss it separately. Since there's no sprouting of dairy, so let's just talk souring — or culturing it. Like making kefir, yogurt, clabber, or other cheeses. The culture that you introduce to the milk to create kefir, yogurt, or a cheese eats the milk sugar (lactose) as its food source. The longer the culture is in the milk at the ideal culturing temperature, the more it eats the sugar (and the more sour the end product becomes!). And although every culture is slightly different, we can say that a 24-hour ferment/culture of kefir or yogurt will reduce the carbs to virtually zero. When making hard cheese, you're looking at needing to age it 60 days to reduce the sugar. Additionally, some cultured dairy will continue to age and reduce sugar even in cold storage, albeit more slowly. Briefly, I'll address the A2 issue… This has nothing to do with the carbs, it has to do with whether or not the cow has a genetic defect that affects the casein (milk protein). What About Trim Healthy Mama? 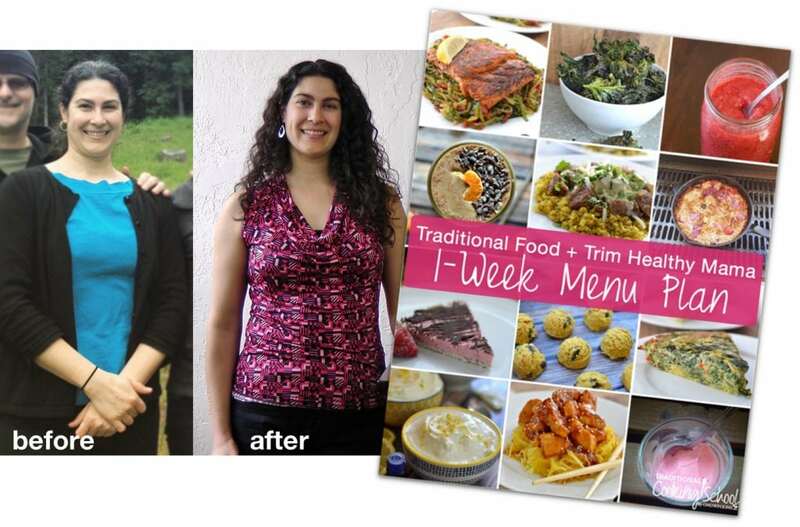 What we've been talking about today works well within Trim Healthy Mama, which I combined with Traditional Foods to lose more than 30 pounds in a year (and I'm keeping it off to this day). The fermented yogurt or kefir (homemade) has no sugar when soured for 24 hours or more. When full-fat, it's an S (fat + protein). If it's skimmed (skim the cream away) then it's a Fuel Pull (just protein) and can be used in either S or E settings. The sprouted or sourdough bread foods that have no added fat (like my FREE No-Knead Einkorn Sourdough Bread Recipe) work well eaten moderately in E (carb + protein) settings. 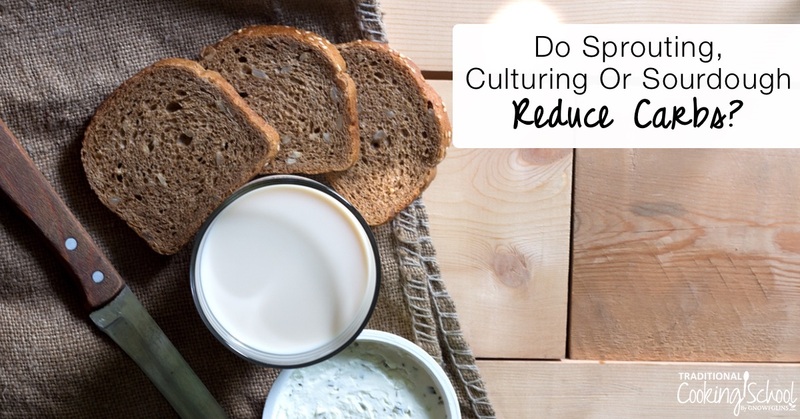 Do you use sprouting, sourdough or culturing to reduce carbs in foods? How is it working for you? I’ve been using thm on and off..after watching your videos I’ve begun making sourdough, sauerkraut, bone broth, and cut out dairy. My husband’s allergies/asthma is practically GONE! 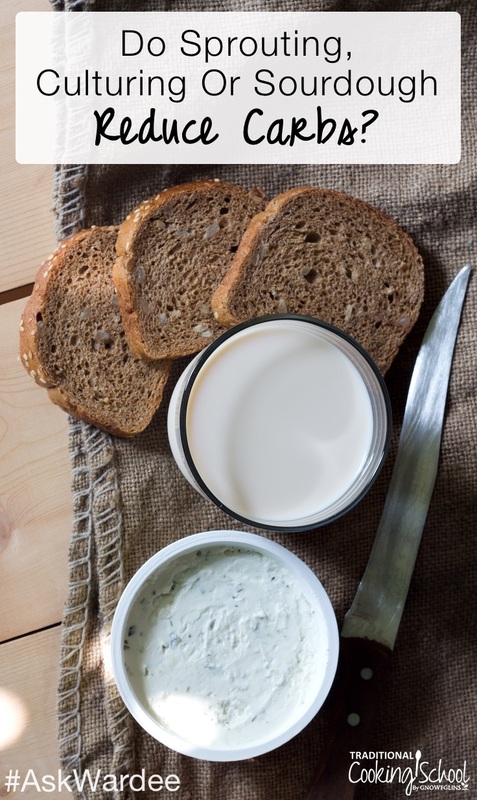 I get raw cow and goats milk weekly and since we’ve been off of dairy I need to find something to do with the cow milk (our toddler drinks the goat milk)… can I make sour cream with the cream and kefir with the skimmed milk? Thank you! my comment is a question. can powdered milk be used to make yogurt? every time i go to the local food pantry, i am given dry milk. overloaded and not sure how use that much. Sorry we can’t be of more assistance!